Spring banding started with a boom! The nets were up and we were ready on that first dawn of Spring migration monitoring! It was a clear, windless, cool morning on April 15th, when at 6:15am, we opened our nets and awaited the bird’s arrival with anticipation. And so it had begun: the daily “routine” of opening nets at dawn, checking them every half hour, and furling them for the day after six hours. A one-hour census is performed every day too, on a fixed route, starting an hour after sunrise, with the goal of recording each-and-every bird seen or heard. And finally, throughout the morning, all casual observations are noted as well. Together, these approaches are geared towards providing the most comprehensive picture of migration as possible. On our first morning, we got the expected species of birds that are migrating at this time of year. Kinglets and juncos, grackles and flickers, robins and crows. The first warbler of the season was observed too: a bright male Pine Warbler! This species is an early migrant but the Yellow-rumped Warbler is usually the first warbler to arrive and be detected. The unexpected birds were all seen during a very productive census: 37 species were detected. And among them, there were five Tundra Swans, flying together in a northwest direction! These were my first tundra swans at Cabot Head and I was elated! In a big flock of Canada Geese, I also spotted two white individuals, which turned out to be Snow Geese. It is the first time Snow Geese have been detected in the Spring at Cabot Head. The two other occasions (in 2006 and 2008) were in the Fall. And the last surprise came just after the mixed flock of geese disappeared toward the northern horizon. Perched atop a Jack Pine, a Townsend’s Solitaire caught my eye after first alerting my ears with a little call! It is a denizen of the mountains of the West but quite prone to winter wanderings across the whole continent. A member of the Thrush family, it has predominantly a grey plumage with a bold, buffy wingstripe, a somewhat long tail with white outer feathers, and a white eye-ring. Like the Snow Geese, it is its first Spring detection, having been seen twice previously during Fall migration (in 2004 by an old friend of BPBO, Al Woodhouse, and in 2005). The banding total on that first day was a very decent 51 birds of seven species. Little did we know what was in store for the subsequent few days. After such a cold and snowy first half of the month, these first days at Cabot Head were clear, relatively warm, with a nice southeast wind, perfect conditions for birds eager to move north to their breeding territories. On the 16th, we started our day like any other one – opening the nets shortly before sunrise and getting ready to see what they’d capture. But as the sun warmed the woods, the kinglets started to become more active. And very soon, our nets were filling up fast. Thanks to two experienced volunteers, Marco from Italy and Rachel from Wakefield, the birds were safely extracted and brought back in a constant stream to the banding lab where I sat for hours banding one bird after another without taking a break! When all was said and done, and the nets were finally furled, we contemplated a record-breaking day: 212 birds had been banded! The previous record was 203 banded birds on May 17, 2010. The most common species banded by us on this day were Golden-crowned Kinglets, with 140 birds banded (previous one-day high of 137 on 21 April 2009) and Brown Creepers, with 27 birds (previous record of 26 on 19 April 2007). It was therefore with some trepidation that we opened the nets on a very similar looking morning on the 17th. Another clear, calm night had given way to rising temperatures as the sun started its slow orb in the heavens. And indeed, we were found ourselves in a similar situation as the previous day. This time, though, the kinglets and creepers had decided to come out in full force to keep us running and banding for the entire morning with no break! Again, hats off to the small team of volunteers for an excellent job. The day-old record was not merely broken, it was shattered to pieces and scattered to the winds of history. A never-before and (hopefully never-again) 389 birds were banded on that now famous day of April 17th, 2016! The tally included 314 Golden-crowned Kinglets and 42 Brown Creepers! More Golden-crowned Kinglets were banded in that one day than in a normal spring season (but one, in 2009). 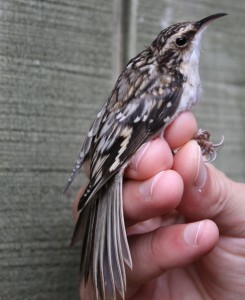 Likewise, very often, less than 40 Brown Creepers are banded in a full season. The previous highest season total for Golden-crowned Kinglets was 431 birds in 2009. In just two days, this spring, we banded 454 of them! Finally, on the 18th, it felt like it was going to be a repeat of the previous two days, when more than 20 kinglets were caught in a single net during the first net check. But, we got some respite, as these were only the rear guard of the migrating flock. In the end, we still banded 99 birds of 13 species on that day, which, in any other Spring, would have been considered a very good day. It felt like an easy stroll, though! In all this banding madness, we managed to squeeze in some observations: the first Palm and Yellow-rumped Warblers seen on the 17th. 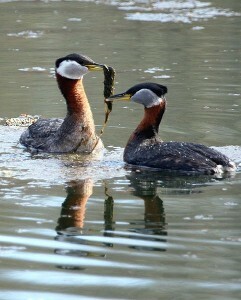 Also, a small group of 20 Red-necked Grebes were observed on the bay on the 18th, alongside three Horned Grebes. Birds must have felt the change in the weather. Mid-morning on the 18th, the wind shifted from southeast to west and clouds started to accumulate. There was some rain in the evening. The weather cleared overnight, though, which permitted another full morning of banding on the 19th. This time, it was the bust that very often follows a boom! We caught only 25 birds, with a mere three Golden-crowned Kinglets. The woods were very quiet, with little movement, except for a few Sharp-shinned Hawks and Yellow-shafted Flickers. Needless to say, we welcomed this slower pace at the nets, especially so because Rachel had left us to return to work. I may have used the word “routine” earlier, but, as these last few days prove, there is no such thing as routine in the world of bird migration. Every year brings its share of excitement, change and wonder to behold! This is the first time reading your blog. I have a cottage in Lion’s Head and have visited the station many years ago. I hope to come to the open house in September. My husband and I so enjoy birds (inherited form my Mom). They give us great joy. Wow! An exciting season so far. Welcome back! I am getting set for move to Cabot Head Lightstation, opening May 1. Well done – so exciting! So fascinating. I live in Wiarton and love to watch the birds at my feeder. Is it possible to come up just for a visit and see what you do? Yes, we have an open house on September 10th when the public is invited to come and see what happens at the station. Also. If you are a member you can arrange to go and have a visit by contacting us by email. Well, a first few days like no others. Tremendous that you have such talented support with Marco and Rachel. Good for you to stick with it. Some great observations also. Mid April on the Bruce can be tremendously exciting for birds – as can any time! Wonderful Stephane! Great reading and exciting about all the birds! I have been waiting for my Brown Creeper to return here but haven’t seen him/her. Better look more closely!